Holy cow and the moon, Sydney loves gelato. These days we'll happily join a kilometre-long queues if there's a cone of salted caramel at the end. Why does the dessert hold so much appeal? It could have something to do with shared childhood memories of eating ice cream as an after-dinner treat. More likely it's because gelato is plain delicious. 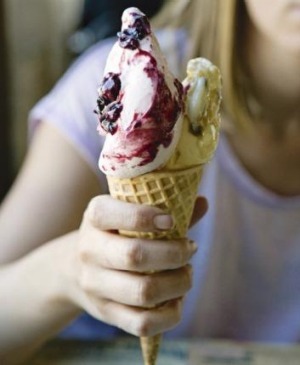 In any case, here are some of Sydney's best spots for a scoop. Anyone suffering from queue allergy will be wise to load up on antihistamines if visiting Cow and the Moon on a weekend. This family-run Enmore gelateria made headlines in 2014 when it won best gelato in the world for its mandorla affogato flavour at the Gelato World Tour in Rimini, Italy. Not just best in Australia - best in the entire dang world. The judges chose wisely. The lauded flavour combines caramelised almonds with Kenyan Single Origin coffee on a Madagascan vanilla base. It's some next-level stuff - a perfect balance of bitter and sweet. Cremeria De Luca's gelato is classic, no-nonsense, creamy goodness. The De Luca family has been making gelato since 1937 when Salvatore De Luca was issued his licence on the streets of Messina, Sicily. Salvatore's son, Luigi, opened the first La Cremeria store on Leichhardt's Norton Street in 1995. It shut in 2009, but the De Luca family came back to the gelato fold in 2013 and opened a new shop in Five Dock. There are no puns in the flavour names here and no Allens lollies in the mix. The gelato is (correctly) stored deep in the counter instead of piled up high like a Marge Simpson wig and tastes all the better for it. Order to eat-in so you can sit next a vintage Early Kooka electric stove in the cute-as-a-button back room. You can have your zabaglione (Italian custard) and gingerbread panna-cotta gelati presented in a frosted handkerchief glass or sandwiched between two slices of brioche with Nutella and whipped cream. I rarely buy gelato from Messina any more but this has more to do with my dislike of queues than Messina itself. For this article I visited Messina's outpost at The Star where there was no line-up anyway and just a couple of tourists wearing Crocs. Messina has 35 signature flavours and five rotating specials with puns that tabloid sub-editors can only dream of such as 'Candy Warhol', 'This Is How We Scroll' and 'Biggie Smores'. The chocolate fondant flavour is deeply rich with a bite of bitterness, but that salted caramel, oh boy. Salt, sugar, and, fat: the three amigos that make taste buds go bananas reaching their ultimate potential as a team. It's Messina's most popular flavour with good reason. Cafe Court, The Star, 80 Pyrmont Street, Pyrmont, 1800 435 286. Also at Darlinghurst, Surry Hills, Bondi, Parramatta, and Miranda. Why do so many gelatarias insist on installing installing the kind of fluorescent lighting that makes the spaceship in 2001: A Space Odyssey look like Darth Vader's basement? 7-Eleven lighting aside, Cronulla's Frangipani makes some terrific gelato that's cold, and creamy with just-right sweetness levels. Frangipani's gelato queen Diana Kontoprias received a peer's choice award in the 2014 Gelato World Tour for her pavlova creation. Her interpretation of the dessert involves a meringue-flavoured base with passionfruit puree and bits of meringue folded throughout. Good to see boysenberry making an appearance in the gelato counter. It's been too long, old friend. However, the banoffee is your go-to flavour here. It has banana flavour for miles. At around 3:30 in the afternoon this Lindfield cafe is filled with school kids wrestling with leaning towers of chocolate and strawberry scoops. Gelatiamo's Turkish delight flavour is excellent, tasting just like Fry's famous chocolate bar version of the sweet, and the nocciolina number involves peanut butter gelato swirled with caramel and studded with chocolate and salted nuts. The staff (all of whom are legends) pump out quality cups of Toby's Estate from a La Marzocco machine if you're taken by the need to make an affogato mouth-milkshake. Since 1959 Leichhardt locals have been lining up for their daily coffee fix at this Norton Street institution. New owners took over Bar Italia in 2014, but it remains largely unchanged. The hospital kiosk chairs are still there, as are floor tiles that look like a geometry professor's fevered dream. Bar Italia gelato is a necessity after a carb-coma inducing meal on Norton Street. The pistachio flavour is king but a recent visit saw my dessert date and me polishing off a cup of the chocolate in scarily quick fashion. It's not fancy gelato and it doesn't strive to be. It's just a nice, honest way to cap off an evening. Viva Bar Italia. RivaReno doesn't have the liveliest shopfront around. However a trip inside the Darlinghurst outlet off this Italian-born franchise is rewarded with the creamiest gelato I've had in Sydney. The 'New York' creation involves maple syrup and pecans, and as a sucker for maple-syrup flavoured anything it had me from hello. Kudos to the champion behind the counter who suggested other flavours to go with the New York. Flavour matching gelato scoops isn't given enough importance, especially on a hot day when they have a cup-life of ten minutes before melting into the one milky puddle. We agreed on the 'Contessa' number of Sicilian almond with crushed amaretti biscuits and it was a taste sensation for the ages. 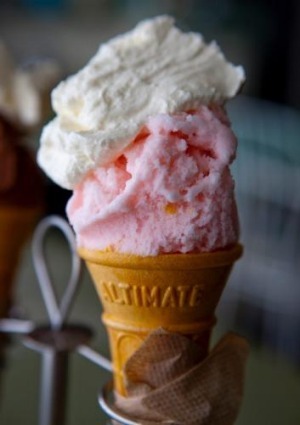 It used to be that no trip to Bondi was complete without a visit to Pompei's for a cup or cone of old school gelato. Messina is now nearby and pulls the bigger crowds, which is fine because it makes the wait for Giorgio Pompei's biscotto e panna (chocolate biscuit and jersey cream) gelato shorter. Pompei's is a pizza-and-pasta trattoria with a streetside gelato bar which sells traditional gelati made with natural ingredients and biodynamic milk. Flavours include cream and homemade caramel and cioccolato variegato (milk and dark Amedei chocolate with hazelnuts and wafer). The latter pairs fantastically with a helping of Pompei's Sicilian blood orange sorbet. There's a cookie-cutter Starbucks vibe about this gelateria at Broadway's Central Park complex but don't let this deter you from visiting. Anita's gelato is solid stuff. Flavours fall somewhere between Messina modern (peanut butter and chocolate, Ferrero Rocher, pina colada) and traditional (chocolate with almonds and caramel, pistachio, strawberry). The rum and raisin tastes like Christmas pudding and a pear and wine creation (featuring actual pears) is a refreshing hit on a summer evening. A scoop of the salted caramel and white chocolate number after a bowl of rib-sticking ramen from Ippudo below is an excellent idea. 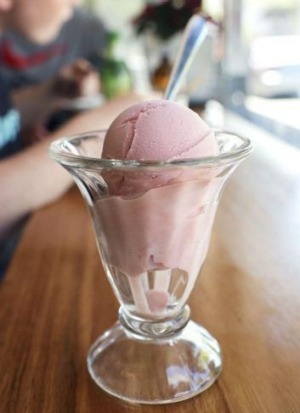 N2's gelato flavours make the creations at Messina look like tubs of Neapolitan. Past concoctions have included wasabi and pea, salt-and-pepper squid, and Vegemite with Sao crackers. The gelato is made to order by pouring the mixture into a KitchenAid and topping it up with liquid nitrogen so it flash freezes. The "Beer and Crackers" cup I tried at the Newtown store was made with Young Henry's natural lager and topped with prawn crackers. The beer taste was mild but there was still enough of it to make things unpleasant. A bit like the remains of a hangover in the afternoon. I also tried the 'Brokeback Moment', a less out-there creation of honeycomb vanilla gelato and honeycomb bites capped with a choc-top and syringe filled with warm caramel. I can attest that injecting gelato with 10cc's of deliciousness is terrific fun.